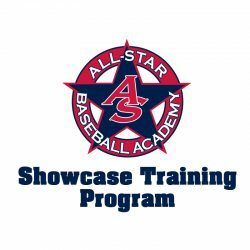 All-Star Baseball Academy is offering several packages that will help 2020-2023 Graduation Year players prepare to showcase their skills in front of the college coaches they covet the most. Over the course of the 8 week training program players will learn each aspect of the showcase while being trained on the following topics to help prepare players mentally and physically for baseball at the next level. DEFENSIVE TRAINING: Catch throw efficiency, outfield crow hops, infield footwork, arm slot training, and catchers pop times. OFFENSIVE TRAINING: Bat speed training, mental preparation for showcase batting practice, 60 yard dash training. Players will participate in the workouts Warminster, PA from June 5th – July 31st (skipping July 3rd). Players in 8th – 10th grade who may not be ready for a showcase event can get a head start by participating in the workouts without committing to any exposure events. Showcase Training Programs are $399 per player and we suggest speaking with one of our staff for suggestions on which events to bundle with for your child. If you have any questions regarding the Showcase Training Program, click here to contact us or call 484-770-8350.